I used an embossing folder for the mokume gane texture, with a red clay sheet over a thicker yellow one, so that a patterned yellow shows up on the red when I slice away the raised areas. The slicing didn’t really work so well, so I impressed the same texture again onto the same clay. From this sheet, I cut out a square that would fit into a pendant frame that I own. I then applied red and gold Perfect Pearls on the raised surfaces of the square, and smoothed out its edges. I filled up the pendant frame with scrap clay – I anyway had leftovers from the slicing and the cutting out of the square – and then set the square over it so it appears somewhat domed. A 20-minute bake completed the pendant. So that’s my super-quick project for the Art Elements challenge. Today’s the reveal, and I’m eagerly looking forward to seeing what the other guests and the Art Elements team have created, and I hope you are as well! 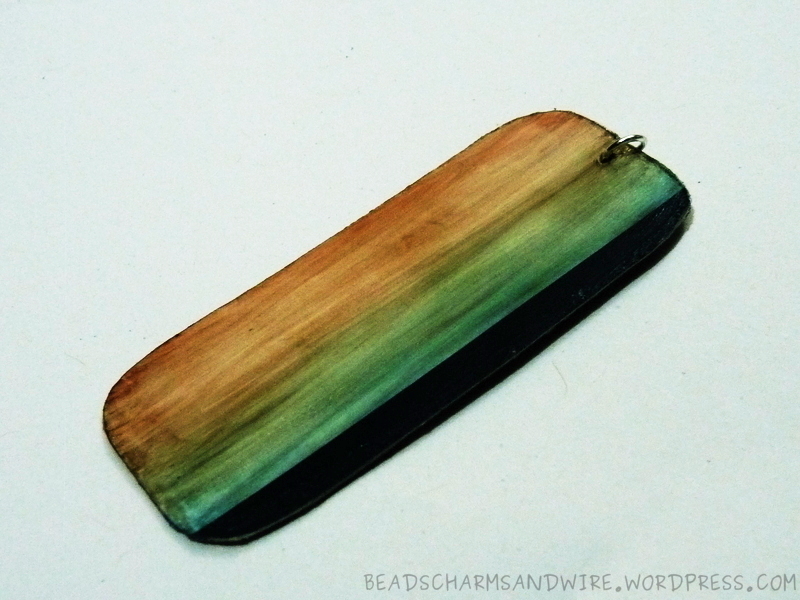 Teresa’s course is about beautifying a wooden jewelry box using painting, silkscreening, decoupage and resin. Amongst all PCA projects I’ve worked on so far, the lack of materials where I live is most evident in this one. I had to first flip the lid of the box inside out, since it originally had a flat outside and an inset on the inside. However, the reverse is what works for this project. I managed to paint the box fine — a red-brown base layer, and then some white and brown lightly distressed texture over it. I toyed around with the idea of an image transfer onto the surfaces. (Looks like my latest project is still on my mind! 🙂 ) But I’m still not sure that the transfer will turn out 100% alright. If it turns out patchy, that’ll be the end of this box, since I won’t be able to cleanly wipe the ink away. Instead, I tried using a texture stamp to imprint some nice patterns on the box, but it turned out pretty bad. In the end, I just used the texture stamp on a sheet of clay, and lightly ‘antiqued’ it with white paint post-bake. I also added a clay border to the inset since the textured sheet didn’t really warrant using resin. I finished with a thin layer of Mod podge instead. My project is nowhere like Teresa’s, but I still like it since it turned out perfect to store our antique jewelry. 🙂 My sis wants to decorate it even more, and I can’t wait to see how she’ll enhance it! This little blue book cover is my next project in PCA 2017, inspired by Anke Humpert’s course on making mosaic notebook covers. I made one for my sister’s spiral paper pad. I’m pretty happy with my Skinner blends now. It’s all thanks to my pasta machine that the amount of manual labor involved is reduced a hundredfold when compared to using a roller. Also, like I mentioned in an earlier post, I now prefer drilling holes post-bake, since it gives a neater finish. That’s exactly what I did for the nice little row of holes for the spiral. It wasn’t all smooth sailing, however. I did have to fix stuff. The other side of the cover ended up with some cracks, because I traced over some not-very-visible borders with a knife lightly (or so I thought) but at a few places, the blade did make it through to the other side. I didn’t notice it before baking since I placed my working surface directly in the oven. 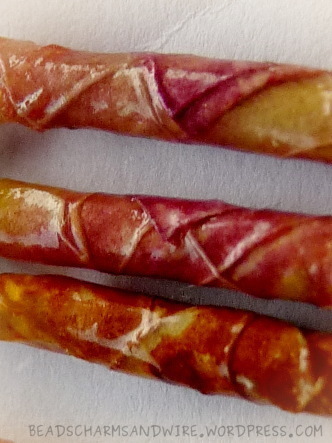 Later, when I did notice it, I just mixed solid clay with liquid Sculpey and smeared it over the cracks, and rebaked it, and that fixed the problem. I’d love to keep making these covers — there are just so many possibilities here! I’ll need more variety of deeper stamps, though, if I’m to use antiquing. Right now, I have just too few stamps that I can use. Mixed Media — my latest muse, because, let’s be honest, who wouldn’t want to work with all the things in their project! 😉 So it’s no surprise that the next item I chose in PCA was mixed media — a Hope Angel canvas by Barbara. I wanted to have a face in my piece too, but wasn’t too happy with my angel, so I drew upon some inspiration and made a Hope Tree instead. I didn’t think the delicate background that Barbara makes for her piece would work for my tree, so I added more media to draw out the textures and colors. My! That was a good decision, and I was almost in love with the piece already. 🙂 I experimented with adding this and that to complement the tree, and finally used a bird and a peace sign to complete the piece. I fussy cut the bird (hehe, I’m using terms that I learned from my sis) from a clay sheet that I textured, because none of my stencils worked size-wise. And I die cut the sign, painted it and stenciled in the lettering. 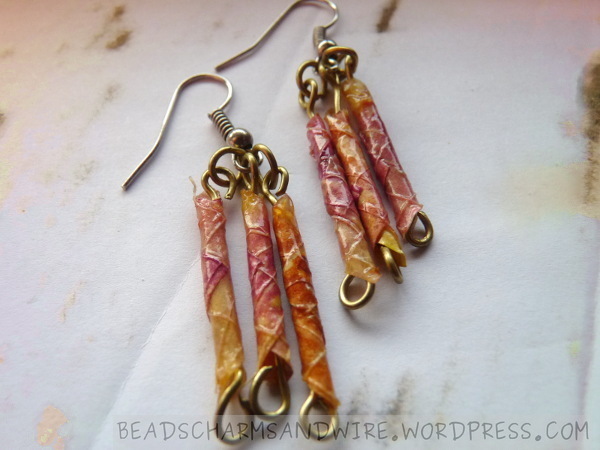 I love the colors on these earrings, and the texture. ❤ What gave them this texture, you ask? If you read the title of this post, you already know 🙂 — a paper envelope lined on the inside with a loose thread mesh! The envelope had arrived by post. I don’t really remember what was in it, but I remember feeling impatient while reading its contents because I wanted to use the envelope, highlighting its texture. 😀 And I’m not disappointed at all with the result. I cut an approximately 6cm x 9cm piece out of the envelope, placed it mesh-side up, and colored the surface yellow and maroon. You can also see lots of orange there that resulted from the blending of those two colors. Isn’t it beautiful? Of course, I applied a very small amount of glue at the outermost corner to make the structure hold. After the glue dried, I applied a whole lot of varnish, layer after layer after layer, waiting between applications to let the latest layer dry. I did this until the threads from the meshes appeared softer. I then made them into earrings by threading wires into the cylinders, making large eye loops at both ends. I added the cylinders to earring findings, 3 per earring. To make them hang more freely, I also added jump rings to 2 cylinders (per earring) before attaching them to the findings. I cut two fairly sturdy sheets of cardboard into rectangles of desired shape. Mine are about 1″x2.5″ (2.5cm x 6cm). If your cardboard is thick, remember to cut holes for the final finishing right now. (Even if it’s not thick, it would probably be easier to cut the holes.) I shaped the circumference by first snipping off the corners into rounded ones, then lightly sanding the whole edge with a 400-grit sandpaper to give it a rough, half-finished wood-like feel. I then glued the two pieces together. If you’d like to, you could have another go with the light sanding, but I left the piece as is. I applied watercolor paints on the piece, light brown on one long end and light blue on another. Note that for this to work, the brush should not be too wet. I made really long strokes, all along the length, sometimes straight, sometimes slightly oblique, until the texture slowly evolved to my satisfaction. I’d wanted a stripe of dark blue at one of the long ends, so I’d chosen cardboard that already had a stripe. (I’m lazy that way. 😀 ) But if you’d chosen plain cardboard and want a stripe too, you must wait until the paint dries. You could then cover the part where you don’t want the stripe with neatly-cut scrap paper, and paint away the exposed part. That’ll give you a straight stripe, and you can remove the scrap paper then. I wanted the finishing to have some texture too. 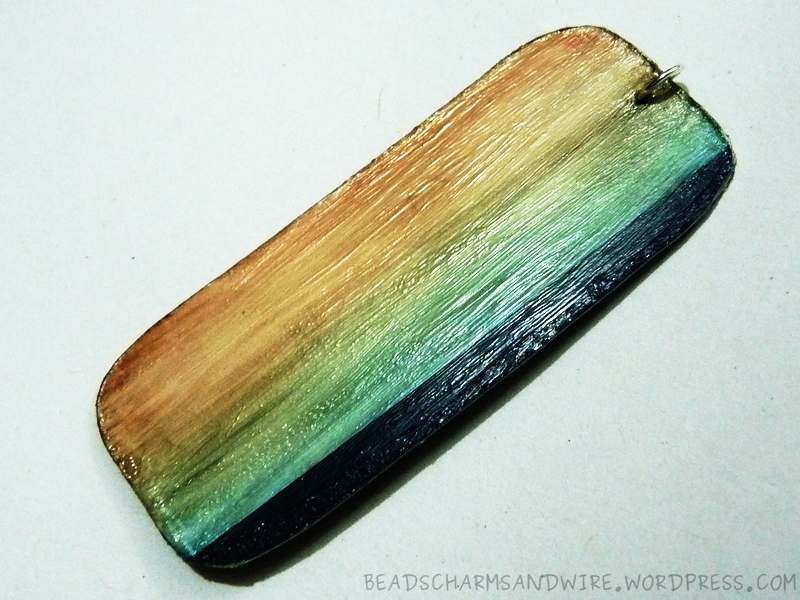 Since the edges of the pendant are rough-wooden textured, I thought I’d try for a similar finish. I chose glossy Mod Podge for this. (I have no idea how a matte one will turn out. Personally, I think the texture won’t be very visible.) I scooped up a glob of the stuff with my finishing brush, and kept applying it, again with really long strokes, continuing even when it started drying. While it dried on the pendant, it dried on the brush too, which made it convenient to turn the strokes harsher — see the soft gouges in the picture below? There, that makes for a textured finish! So, are large, textured pendants your cup of tea? Would you make this differently, unique to you?